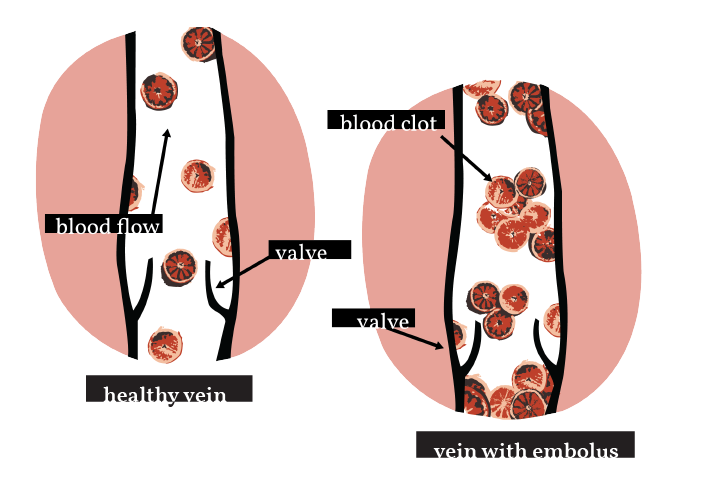 A deep vein thrombosis, or DVT, is a blood clot that occurs in a deep vein, usually in the legs. It can be caused by inactivity (possibly from travel), an inherited disorder, or external factors. Risk factors include age over 65, family history of DVT, the use of certain oral contraceptives, estrogen therapy, pregnancy, bone fractures, recent trauma or surgery, and malignancy. Smoking is also considered to increase risk of a deep vein thrombosis. Many patients are asymptomatic, but symptoms of DVTs include swelling of ankles and calves, tenderness, pain, warmth, and redness. They are usually unilateral, or in one leg. It is important to seek medical attention if you experience these symptoms accompanied by the risk factors. DVTs are concerning because they can be very dangerous. Blood clots can be discharged and travel in the bloodstream, which is called an embolus. The embolus can travel to your lungs, causing a pulmonary embolism (PE) which can be fatal, or they can travel to your brain, and cause a stroke. Patients with PE can also be asymptomatic, but symptoms may include dyspnea (shortness of breath), chest pain, coughing, calf pain or swelling, wheezing, and coughing up blood. Many patients that have a DVT or a PE have to be on anticoagulants (blood thinner medication that reduces the risk of clots) for the rest of their lives. As with most heart issues, you can prevent a DVT by avoiding smoking, losing weight, avoiding sitting for extended periods of time, staying active and exercising regularly, especially if you travel frequently, or have a job that requires sitting.